Now that I’m back from the Dell suites in Las Vegas, and all the dust has settled, I can take a quick moment to take a closer look at the hardware Alienware announced at this year’s CES. The hot one everyone’s talking about is the amazing new Alienware M17x. 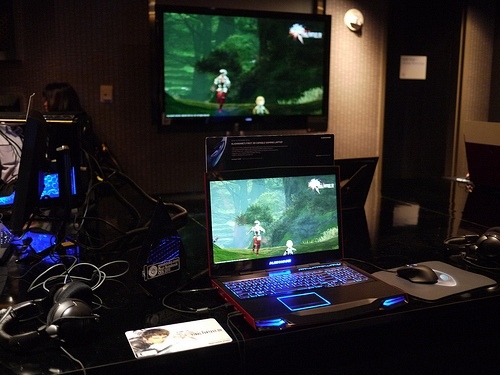 The M17x was the Alienware darling of CES, and was crowned notebook.com’s best laptop of CES 2011 . The M17x features the CNET “Best of CES” award winning Intel Sandy Bridge CPU, can be configured with up to 8GB of RAM, and with a 3D capable display and NVIDIA’s GTX 460 graphics card, holds the title of Alienware’s first 3D capable gaming laptop. For those that want to pull out all the stops, the M17x can also house dual 256GB SSD drives, making this laptop scream even faster. If all of the above wasn’t enough, the new M17x also features WirelessHD technology. I had a chance to see this tech in action at the Dell Suites, and was completely blown away. The new M17x can broadcast uncompressed HD video wirelessly to your wireless capable monitor or HD TV with absolutely zero latency. Are you afraid that PC gaming on your living room television would mean a tangled mess of unwieldy wiring or would require an engineering degree? Not anymore. WirelessHD makes it possible with little fuss or tech know-how… and looks absolutely amazing as well.Here's a pic that Lionel took of an M17x connected to the large screen via WirelessHD. You can click on it to see a larger version. One last new feature I’d like to mention is the addition of HDMI-in to the M17x. Coupled with WirelessHD, HDMI-in allows gamers to attach gaming or video play back devices to the M17x and broadcast to your TV, monitor, or simply view on the laptop’s 17-inch LCD. With an M17x, you can connect your Xbox or Blu-Ray player to your computer, and control everything from your keyboard. The price? The M17x starts at just $1,499. In addition to the M17x, Alienware also announced the new Aurora desktop. In addition to the cosmetics (you can actually get your Aurora chrome plated) this beastly machine boasts an impressive 400W of dedicated graphics power. To take advantage of this, the Aurora can be configured with one of three different graphics options: dual 1GB NVIDIA GTX 460s in SLI, Dual 1GB ATI Radeon HD 6870s in CrossfireX, or dual 2GB ATI Radeon HD 6950 in CrossfireX. For the uninitiated, I’ll take a quick moment to explain the benefits of each. Which graphics option you choose completely depends upon what you’d like to do with your Aurora. If 3D gaming is your goal, NVIDIA is the option you want. NVIDIA is the leader in 3D gaming, and therefore the NVIDIA card and a 3D capable monitor is required to experience 3D gaming. You’d also need the glasses, of course. For more information, check NVIDIA’s page explaining its 3D Vision technology. If multiple monitors are your main concern, ATI may be your best choice. The NVIDIA graphics option can support up to three displays, but if you’re looking to hook up four or more, ATI cards are required to take advantage of ATI’s Eyefinity Technology. Eyefinity enables up to six independent display outputs simultaneously in a variety of configurations. To get an overview of what Eyefinity is capable of, check here. Along with these extreme graphics options, the Aurora also implements Intel’s Sandy Bridge CPU technology, comes configured with up to 16GB of DDR3 1600MHz RAM (or 8GB of DDR3 1866MHz RAM), and can come with up to 2TB of storage. It also comes factory overclocked up to 4.1GHz, and this option’s price has recently been reduced. With a starting price of $1,799, this class of desktop has never been easier to acquire. As always, we welcome your comments. I hope that like me, you’re excited about the latest developments in gaming technology, and are excited to see where this is all headed in the years to come! I bought the M17x R3 on January 12 and I don't see anything in the device manager that relates to Sibeam or wirelessHD. Did Dell screw up building my system? I have seen several posts related to the wireless video capability with alienware. Please help tech support has been no help.